It's that time of year again. The months of March, April and May mean one thing to researchers and divers in Placencia: Whale sharks. These sea creatures appear like clockwork during the spring months. Just wait for the full moon and several days afterwards these huge giants will start to appear in the area known as Gladden Split. What draws the largest fish in the ocean to this particular spot? Gladden Split is known by many fishermen from Hopkins, Seine Bight, and Monkey River for the large aggregations of grouper and snapper that gather at this point on the Barrier Reef to spawn with the full moon each month. In the spring, thousands of Dog and Cubera snapper come together to reproduce and it's the large amounts of released gametes that provide a plentiful source of protein rich food for the Whale sharks. Whale sharks can obtain lengths of up to fifty feet and weigh as much as 18 metric tons and yet pose no real danger to the large numbers of divers that travel to these feeding sites in the hopes of catching a glimpse of the elusive giants. Whale sharks feed by filtering large amounts of sea water over their large gill rakers and extracting planktonic organisms, small bait fish, thimble jellies or tiny squid. Whale sharks are found in tropical waters worldwide and predictable feeding aggregations have been identified near the Philippines, Australia, Maldives, Baja/Mexico, South Africa, Honduras and Belize. Recently, Green Reef staff has had the opportunity to work with researchers from The University of York and The Nature Conservancy on Whale shark research at the Gladden Split aggregation site. Researchers here are conducting monthly underwater surveys and tagging Whale sharks in an effort to learn more about this species. This data collected about the population will hopefully then be transformed into useful and applicable information that will help manage and conserve these elusive creatures. 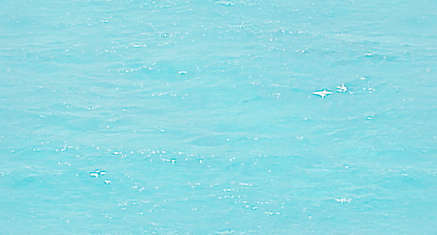 Recently several San Pedro divers have reported seeing Whale sharks off of Ambergris Caye. You can help in this research by keeping a look-out for Whale sharks and if you see one, please take a moment to record the following: 1) time, date and location of sighting; 2) number of sharks and approximate size; 3) any distinguishing features or scars; 4) tag type, number and placement; 5) Tour Operator's name and 6) your contact information. Please send this information to: Belize/UK Initiative, Box 170, Punta Gorda, Toledo District, Belize. As always, Green Reef is interested in hearing from the residents and visitors of San Pedro. Feel free to contact Green Reef at 026-3254, extension 243 or E-mail us at greenreef @smu.edu.bz.